Bringing Metal To The Masses! TMD has racked up millions of views from readers in 100 countries!! Rocket Solved "The Ripper" Case? #Truth T-Shirt NOW IN STOCK!! Rocket Named Top Conspiracy Theorist! Biggest Hoax Article of 2017!!! Cornell Suicide: Too Much Blood? Rocket Fights For The Truth! The Mark Of The Beast! TMD Rocks Millions Of Impressions On Twitter! The Low Budget Netflix Romp Is A Smash Success! Subscribe To TMD’s Feed For The Latest Updates! Steven Tyler’s Hologram Malfunctions On Stage! The Best of PANTERA Mix! 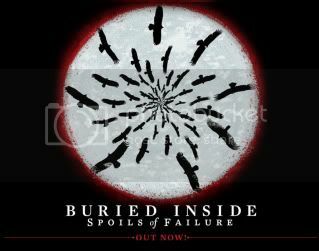 Ottawa, Ontario’s BURIED INSIDE, who announced earlier this year that they’ll be taking an indefinite hiatus after 13 years as a band, has announced one last final performance. This last show will be November 13th at Babylon (317 Bank St.) in Ottawa, ON and include guests KINGDOM SHORE, BARRIER, CRUSADES, and more.